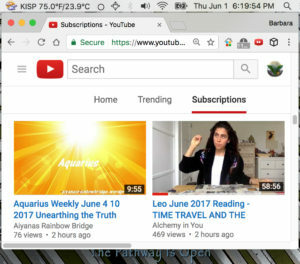 I’m a loyal subscriber to the YouTube channel Alchemy in You. 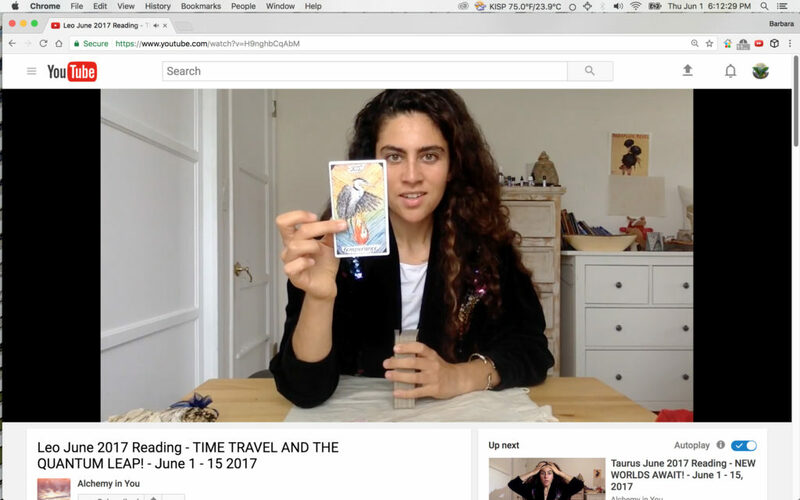 The tarot reader, Natalie, just put out her first few videos for June 1-15, 2017. 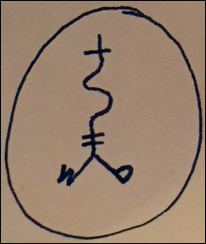 Being that I’m also a cross-watcher of those readings where I feel insight may be gained; both to serve my own curiosity, and also as led by Source, I began to watch her offering for the sign Leo right after it came out. As you can see from the screenshot just below and to the far left, this video was posted sometime around 4:19 p.m. ET here in the US. After watching the first few minutes I knew a long time colleague and former friend, a Leo, may find genuine value in the piece. Being that I’ve grown to trust Natalie implicitly when it comes to her insights and wisdom, I knew whatever she may say during the rest of the 58:55 reading would be of integrity. So I sent it to my former friend. Note: the lives of this friend and I diverged significantly in the last number of months, so this was the first communication I sent in quite some time. 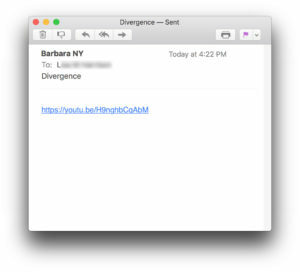 One that was as bare boned as it could be; one word subject line, video link standing alone in the body. However, guided by Source and intuition I just knew it was something I must do. I continued to watch the video. While doing so, and to simply busy my hands, I shuffled my deck of the same tarot cards, The Wild Unknown. Wasn’t attempting to pull any, or seek to gain any messages. I was just playing around. I’ve grown accustomed to do that so I can get use to shuffling these cards, as well as to break them in; having purchased them in late April to better understand Natalie’s readings. Then it happened… a cluster of four cards popped out. Honestly, I simply scooped them up at first with the intention of just putting them back in the deck. But something made me stop and look more closely at them. It was a gut feeling. A knowing, born from the unconscious act of catching a glimpse at a couple of them that there was, in fact, a message for me there – one related to Natalie’s Leo reading. I paused the video to see what they were and was struck at the personal sentiment they shared. That message is mine, and not necessary to be disclosed for purposes of this writing. Yet, I wanted to publicize it, as I’ve come to know, at least for myself, that when I do, it energizes the process and brings enchantment and wonder in return, sometimes even a gift in kind. So, I took out my camera, snapped a photo, and posted it on Facebook, all while continuing to watch Natalie’s video. 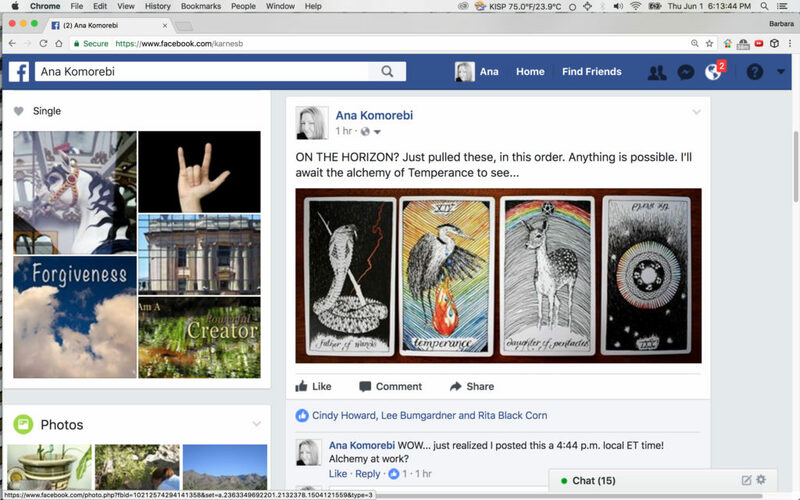 Screenshot of the very end of Natalie’s Leo video where she comes back on after having closed it out to point out what we all saw, that this card – the TEMPERANCE card – fell over as she was ending the reading. Note the card! Temperance! Note the Facebook post where I show the same card as being part of the four card cluster that popped out as I was randomly shuffling. This IS the card I’d personally identified as being the one representing the person to whom the email above was sent. Confirmation I was suppose to send the email – make contact, no matter the outcome. Confirmation that the cluster that popped out was anything but random. Confirmation that Natalie’s video was magically, enchantingly synchronized to display that card at that very moment!! Watch this final scene below! Starts at 58:09. Listen all the way to the very end ! Yes, Barbara… There is More!